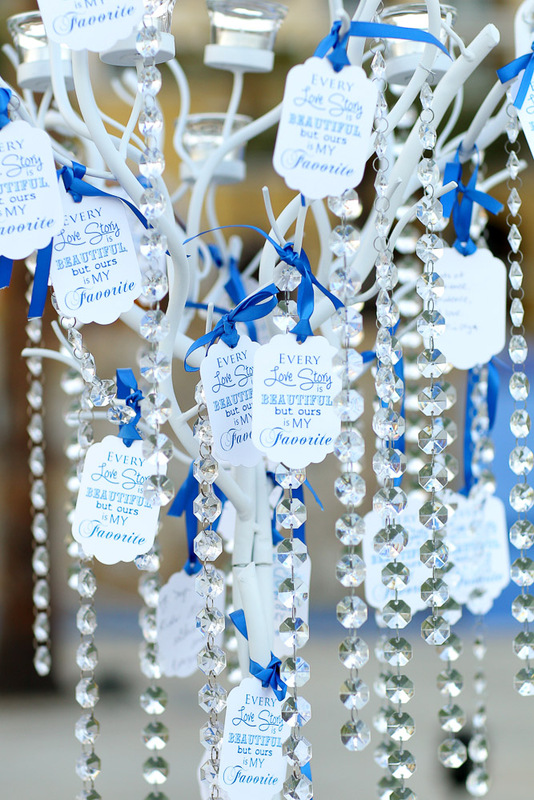 What can we say about this royal blue and silver wedding at Dreams Resort besides WOW? We worked with Tania and Raul for about two years on every last detail of this showstopper, so we are absolutely ecstatic to be able to finally share the results of all our hard work and careful planning! It goes without saying that bride Tania was meticulous about her wedding décor, but then she may have met her match with our detail-oriented professionals! We were happy to design a complete wedding extravaganza with tons of shine and crystals all in the royal blue and silver tones Tania wanted. First we had to consider the many pieces Tania purchased in advance of her wedding, such as the rhinestone cake stand, silver and royal blue wedding favors, rhinestone silver chargers, Swarovski pen holder for the entrance table, royal blue fans for the ceremony chairs and many, many more items for her dream wedding. With all these details as inspiration, we could only do what we do best: Create a unique linen collection for this one-of-a-kind wedding and incorporate it all into an incredible design! We started our linen design with a special bride and groom table, sending Tania photos and samples of fabrics until we found the one she loved. We then used silver sequined runners to tie the sweetheart table design to the look of the guests’ tables. It was apparent this special couple would need an amazing floral arrangement to match the exceptional linen and décor, so we met with Rene at Cabo Floral Studio to come up with a design that would really make a statement. Starting with the sweetheart table, we designed a crystal huppah that covered the bride and groom’s table and really made the couple the center of attention. We had a low arrangement in mind for the flowers on the sweetheart table, and at first we thought to use blue hydrangeas with white roses and orchids. But when Rene suggested the stunning blue vanda orchid, a rare flower better known in a purple hue (but also available in a deep blue), it completely changed this wedding décor. The blue vanda had to be incorporated in the bridal bouquet and in all the floral accents—including the amazing wedding cake! For Tania and Raul’s cake table, we had the elements of the rhinestone cake stand and the unique cake design to consider. We started with a simple royal blue fabric, then we gave it that WOW factor with a few gray and silver ruffles in the front and, of course, a few more rhinestones! Simple Chiavari chairs just wouldn’t do for the ceremony and reception, so we dressed up our white Chiavari chairs with a royal blue band (complete with rhinestone accents) for the guests’ seating. 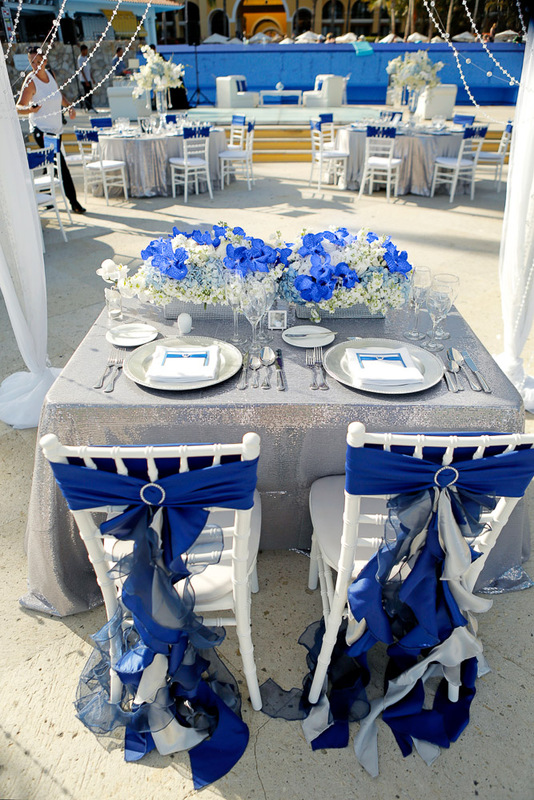 Tania and Raul’s chairs received the royal treatment, with silver and royal blue ruffles inspired by their cake table. We even added our personal touch to the after party by the pool at Dreams: The lounge we provided featured brand new pillows in royal blue, silver and rhinestone! As long as the bride is happy, we are happy! Tania and Raul, your wedding is one we will truly never forget, but your friendship is what we will treasure forever. We cannot thank you enough for trusting us with the most magical day of your lives! 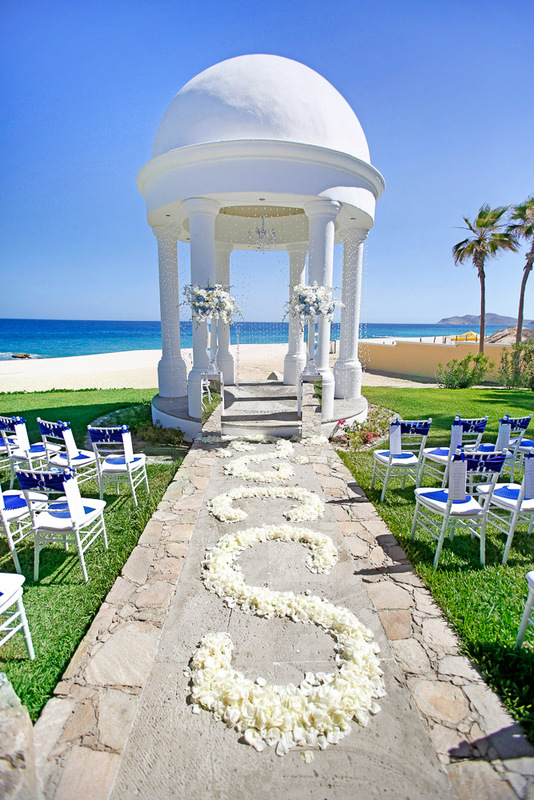 This entry was posted in Accessories and decor, Cabo Floral Studio, High end set-ups, wedding locations in Los Cabos and tagged aisle flowers in Cabo, blue and silver wedding decor, blue vanda orchid, blue wedding favors, blue wedding flowers, CABO FLORAL STUDIO, crystal huppah, crystal wedding, destination wedding Cabo, destination wedding decor, Dreams Resort Los Cabos wedding, luxury linen, luxury wedding Cabo, Mexico destination wedding, rhinestone chair treatment, rhinestone wedding, royal blue wedding, ruffled chair tie, sequin linen, silver cake stand, silver chargers, silver linen, silver sweetheart table, silver wedding, silver wedding favors, sparkly wedding, wedding favor fan, wedding lounge furniture.